I mainly just shoot.38spl target reloads in my GP100. Put a box of full power.357 Magnum downrange yesterday. Had almost forgotten what a good time can be had shooting them. I have a GP100,a Match Champion, and an SP101. Sho’nuff 357 is a hoot out of any of them. I must say, if I had to burn down my house and walk off into the woods, those Rugers and my Marlin 1894CSS might very well be what I grab on the way out. GP100s are a treat. And the big brother RedHawk is no slouch either. Eventually, I would like to pick up a GP100. I've got a Super Blackhawk and a New Vaquero in .44 mag and .357 mag, respectively. I generally shoot .44 spl or .38 spl through them, but it is damn fun to see how they perk up with the magnum loads! 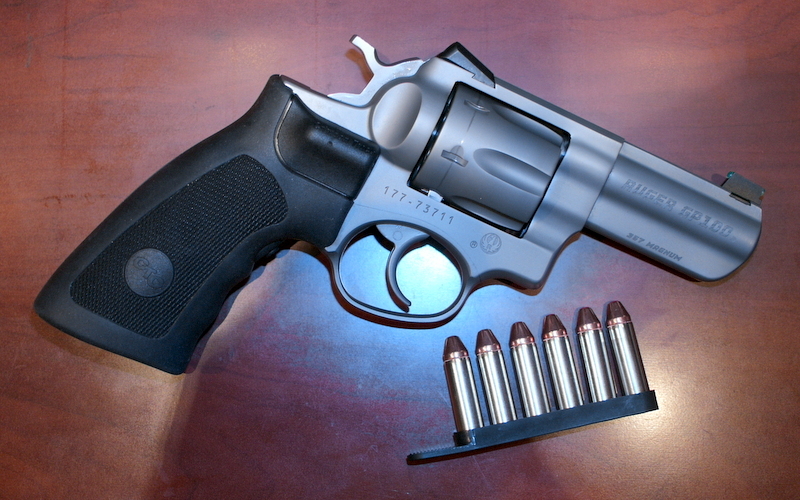 The 4” GP100 is without a doubt the best of all worlds for the .357. You can comfortably shoot full house loads all day and never tire of it. The same can be said for its smaller sibling. .357 is lots of fun, I love shooting it out of my model 19. I don’t even bother with .38 specials. I love shooting my 4" GP100. In fact, when I take my kids to the range these days, they shoot all the plastic guns, and I shoot my revolvers. Another GP100 lover here ! I bought my GP100 quite a few years ago and have shot it extensively. I cant even begin to guess the round count. Never a problem. And no visible wear either. The best gun ever made by Ruger? GP100. Thoroughly enjoy both of my GP100s, standard 3" and a distributor 5", both stainless. The TALO 10mm is mighty compelling for making a triad...if only it came with a 5" barrel. All I ever seem to shoot is .357MAG out of them. A couple years ago, I sold my 4" GP100 to help pay for a (to me) grail gun (686-4 Plus). Told myself I didn't really NEED two 4" 357s. I missed it almost right away. Thankfully, my friend sold it back to me a month or so ago, without having ever shot it. Great friend, great gun! I shoot a GP100 Match Champion For ICORE and love it. I wish they made one in 9mm. I love my snub .357 sp, but I am seriously craving the 9mm version. I love my GP100 but also love my Kimber K6S and Colt Cobra . I'll load 3 38 specials then 3 357 magnums and hand it to them. On the fourth pull of the trigger they jerk up, head spins around with eyes wide open!! Whether plinking grade 38Special or full house 357Magnum loads, the GP100 is a pleasure to shoot.